Josh W., Julian N. & Alex T.
Although this movie is slower due to emulation differences in lag, it is in fact faster (by 13 frames) than the previous submission. This run is the product of 2 years of on-and-off work. Bahamete and Masterjun started and stopped the run in 2013, finishing at Star World 2. PangaeaPanga took the work-in-progress in February of 2015 and finished it. Unfortunately, there are not many differences between this run and the current submission, so there is not much to talk about. Here is a table showing each level in the run, how much time was saved, how much time was lost due to in-level lag, and comments about some levels. Note: only lag that occurred inside each level is taken into account. Yoshi's Island 2 - - We grab a mushroom here as opposed to in Yoshi's Island 1. Yoshi's Island 3 1 - 1 frame is saved due to better block duplications. Yoshi's Island 1 16 - Because of the grabbing the mushroom earlier, we gain 16 frames by not having to slow down to collect the mushroom that pops out of the bush. 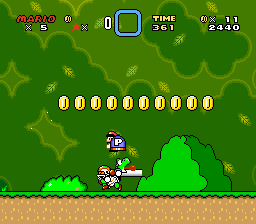 Yoshi's Island 4 -4 - 6/5 was chosen over the hopping glitch because that ended up saving more time due to in-level lag. Donut Plains 1 - - A lot of time was spent to make sure the color corruption at the end gives us the fewest amount of lag frames. Donut Secret 1 - - The last fish was manipulated so that it goes off-screen when killed, to avoid lag at the keyhole. Donut Secret House - - We tried for a more entertaining Big Boo fight. Yes, there is a pattern. 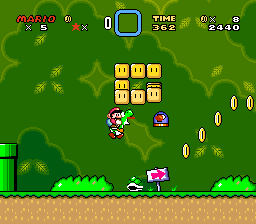 Star World 1 - - Losing 1 pixel (still as fast) at the end changes the color corruption. Star World 2 - - Yay for swimming/cape-spinning to the music! Bowser's Castle - 8 8 frames of lag were gained in the Mechakoopa room. We also managed to keep this Bowser fight jam-packed with more juggling and cape abuse! In the entire run, there was an additional 181 frames of lag due to emulation differences. So it's finally done, the first SMW "warps" run that should be console verifiable. It looks like this run isn't really much better than the previous movie judging from the comparison above, but that is not true. Keep in mind that you can't really compare emulation differences. For example in the level YI4, using hopping glitch in snes9x is no problem, as we can avoid lag, but in lsnes it's faster to 6/5 to slow down at places and avoid lag that way. So basically we didn't really lose time there. Thank you for watching, and we hope you enjoyed watching this as much as we did making this TAS! Mothrayas: Good to see the run redone and improved on a non-deprecated emulator. Accepting as an improvement to the published run. fsvgm777: Reach for the-- oh wait, wrong game.